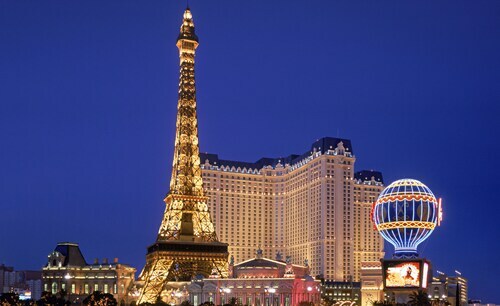 Head to this world-famous resort and casino for a taste of glitzy, glamorous Las Vegas. Head to the place where Vegas began, to experience the mix of traditional and cutting-edge entertainment. Great central location to Las Vegas. The room we stayed in was unbelievable, the balcony overlooked the fountain and the view of Las Vegas at night was fantastic. Well known to anyone visiting Las Vegas. 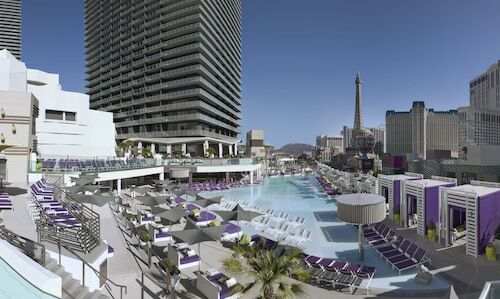 Very nice pool area, great location at the Fremont Experience. Good value for the price. If you’re looking for a holiday experience that’s wild and decadent, only a trip to Las Vegas, NV, will do. Get ready for an amazing visit to a land of neon lights and canyons when you step foot in Sin City. 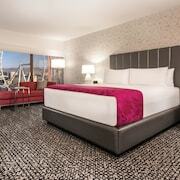 Exciting things can happen when you stay at one of the lavish hotels in Las Vegas on The Strip. 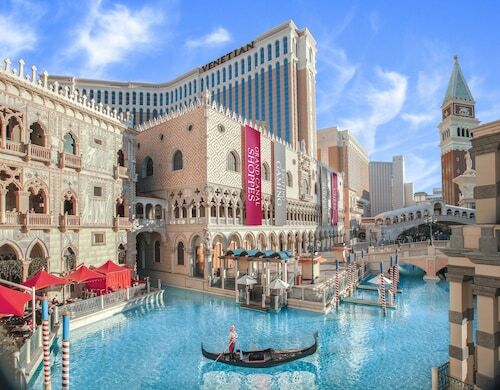 You simply must stop at iconic landmarks like the fountains at the Bellagio, the Chapel of the Flowers, Stratosphere Towers, Siegfried and Roy's Secret Garden and Dolphin Habitat, and the Hartland Mansion. Of course, there is plenty of natural beauty to see in this corner of Nevada once you’ve had your fill of sin and glitter. Be sure to take a detour in your Las Vegas car rental to visit the Hoover Dam Bypass and the Red Rock Canyon National Conservation Area. 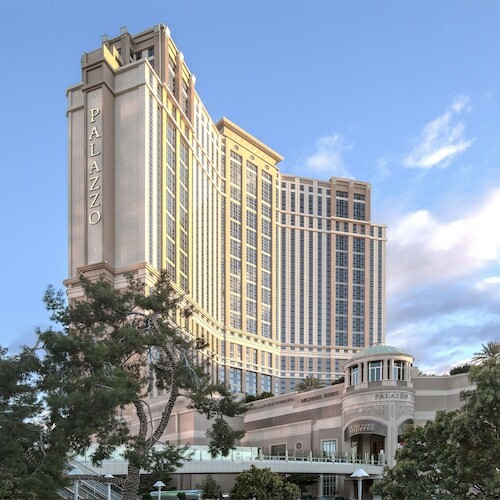 Whether you’re a high roller or you simply want to take in the fanfare and excitement that’s waiting at hotels with a casino in Las Vegas, you’ll always win big when you use Expedia.co.nz to snag cheap travel deals. 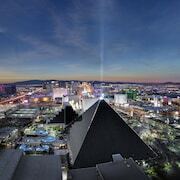 When it comes to finding the best rate on your Las Vegas accommodation, you can count on us to make the dice roll in your favour. We can give you access to amazing rooms at popular hotels that are just a few steps away from some of the most iconic landmarks of Sin City. Whether you’re coming for live shows, gambling, shopping or the party scene, we’ll make sure you have a great room to relax in when you’re not out having fun. The desert climate of Las Vegas makes it a great place to party any time of year. 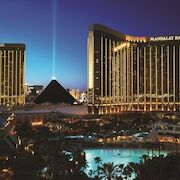 The hot conditions here are what make Las Vegas the ultimate destination for quick weddings and electrifying parties. Things really heat up when the temperature lingers near 33 degrees Fahrenheit between June and September. Things take a refreshing turn in the city when winter temperatures dip as low as 9 degrees Celsius. When you fly to Vegas, choose to land at McCarran International Airport (LAS) to get to the heart of the action without any hassles. Most hotels in the city can easily be reached by a shuttle, taxi, or rental car from the airport. Only Expedia.co.nz lets you win big before you even step foot off the airplane in Vegas! We offer the guaranteed best rates around at Las Vegas hotels. What’s more, our online booking technology gives you the power to browse for hotels in an instant. You can also bundle your accommodation and flight together for one extraordinary price. Are you ready to plan a trip that will go down as a legend in your book? Reserve your trip with us today. Even though what happens in Vegas stays in Vegas, you'll be shouting from the rooftops about how much money you saved on your holiday. 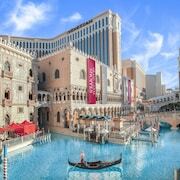 Explore Las Vegas with Expedia.co.nz’s Travel Guides to find the best flights, cars, holiday packages and more!